Boytrapped - The Story of the Statens: Out First RSL Game Of The Season! 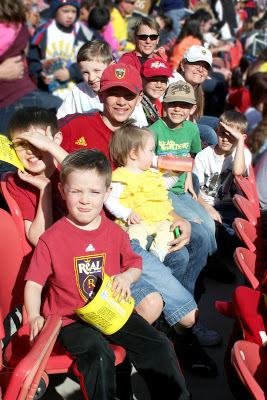 Out First RSL Game Of The Season! If you believe....Then you stand up on your feet! And stand we did! It was our first game of the season at Rio Tinto Stadium and it was SUCH a great game! My boys are in heaven when we are there and honestly....so am I! It was even better because our cousins were there with us. It was mid March so I was a little worried about the weather but it was BEAUTIFUL and couldn't have been a better night! Easter Party At G&G Wittke's!